In the winter of 1994, Tony Bright was visiting an automotive dealership with a display featuring tire chains. Twenty six years of engineering experience led him to ponder the following question: Why do people buy these? They are difficult to install and they do not stay on. Once they fly off your tire they get tangled in your brake lines, causing major damage to your vehicle and likely the highway system. He found the only logical conclusion must be that people buy tire chains due to the lack of a better and safer option. With that Flex Trax™ was conceived. GoClaws™, an advanced engineered tire traction system for use in mud, sand, snow and ice, was the ultimate solution. This technology, a unique injection-molded, high-strength and high-durability polyurethane assembly, represents a significant improvement over historical traction devices such as tire chains, snow tires and studded tires as well as autosocks. Positive-Locking Design- Once installed, it is impossible for the GoClaws™ bolts and screws to ever come loose! Dual locking pins cannot disengage once pulled into the opposing keyhole slots. These improvements provide a smoother ride and add longer life through improved abrasion resistance and less damage to tires. They work great for many demanding applications. SnoClaws™, the ratchet fastening system is the only difference between GoClaws™ and SnoClaws™. Due to new model vehicles having smaller clearance, SnoClaws™ works well with every tire size from garden tractor for plowing driveways up to large SUV / Truck size tires for highway use. It does require that the product be test fit and adjusted to the exact dimensions of your tire. It is essential that the links be custom-fit, especially on smaller tires on smaller vehicles. If not, it is possible that excessively long straps may interfere with the undercarriage during use and cause damage to SnoClaws™. These innovations also eliminate road damage, exceed SAE clearance requirements for each vehicle class, and meet the stricter laws enforced by many federal, state and local transportation departments and authorities. As an example, Canada has made studded tires and tire chains illegal for use in most regions, while giving full approval to our traction systems. GoClaws™ and SnoClaws™ are available in sizes for passenger vehicles to those required for large trucks and tractor trailers. 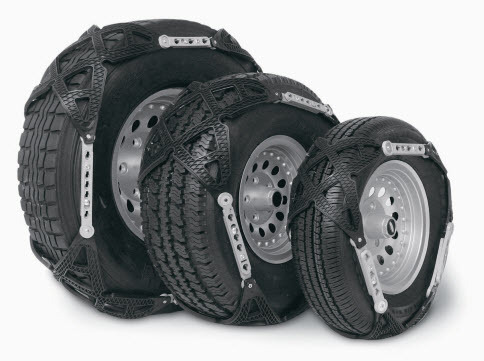 Our products are unique, built to last innovations that can be installed easily over tires without moving or jacking even if the vehicle is already stuck! As with any other traction device, drivers should always exercise caution and be observant of adverse driving conditions. The uses of these products are not a substitute for safe driving or proper judgment by the vehicle driver. Use common sense!! The mission of FlexTrax™ is to change the way drivers view and deal with the impact of adverse weather conditions. Reducing stress and driver anxiety while improving travel safety in difficult traction situations. FlexTrax™ will continue to improve and enhance its product technology through research and development and by incorporating market use feedback. This progressive thinking will allow them to generate a constantly improving, high quality, and timesaving user-friendly traction device.